Join us for this time-honored holiday tradition! 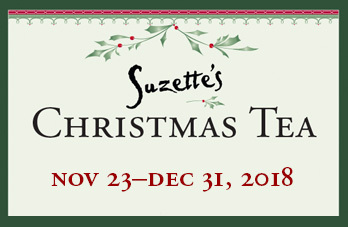 Bring your sisters, mom, grandmothers and friends to Christmas Tea at Suzette's. Come experience this special event in our wonderful, expanded dining room, decorated beautifully for the holidays. What a special way to welcome this cherished time of year. Please note that the only tea offered the day after Thanksgiving through New Year's Eve is the Christmas Tea. IMPORTANT: When making a reservation, please make sure to indicate "Christmas Tea". 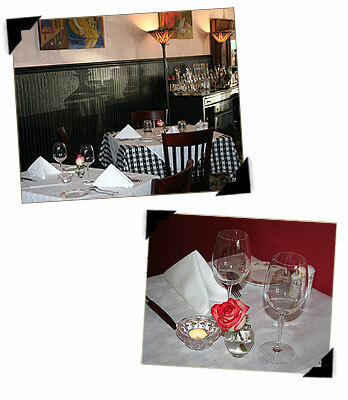 (For online reservations, add this information to the "Special Requests" box). Please note that the only tea offered November 23–December 31 is the Christmas Tea. ...or may we suggest you begin with a very nice Champagne, Sherry or Aperitif to complement your first course of Savories. Freshly Baked Cream Scones Tender, flaky delights studded with seasonal fruits, nuts, chocolate or spices served warm from the oven. Thick, fresh Devonshire Cream and dense, tart lemon curd or jam and honey provided upon request. A selection from our Dessert Menu which includes French Pastries, Fruit Tarts, Dessert Crepes, a Cheese Course or other daily sweet preparations. Choose any Tea with a glass of Champagne, Sherry or Aperitif of your choice. Suzette’s Creperie features Hediard Teas from Paris as well as custom blended teas hand crafted and created especially for Suzette’s Creperie. OR, may we suggest you begin with a very nice Champagne, Sherry or Aperitif to complement your first course of Savories. An aromatic blend of fragrant herbs such as lavender, chamomile, mandarin orange and hibiscus. This flavorful herbal blend contains no caffeine. Like walking through a garden this whole leaf Green Tea is relaxing, healthful and pleasant. It is a heady blend of the finest grade Yin Hao Jasmine Tea and orange citrus. The long twisted tea leaves are picked in very early spring by hand, then carefully layered between Jasmine blossoms. This creates a light yet flavorful blend. It is also low in caffeine. Aromatic blend of tightly rolled gunpowder green tea and refreshing organic peppermint leaves. An all day, every day tea. Whole leaf Ceylon Black Tea from Sri Lanka and Assam Black Tea from India are delightfully blended with Cassis (Black Currant). This blend yields a light fruity taste with rich body. 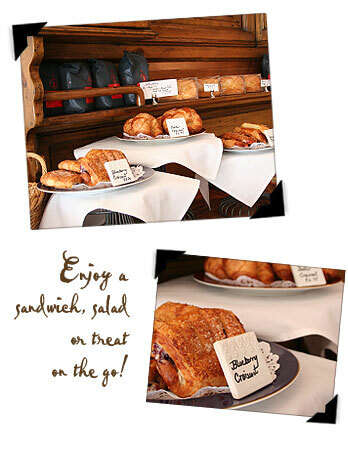 Enjoy alone or with many food accompaniments. A hearty Scottish blend of Chinese and Indian black teas. This tea yields a strong brew favored in the Scottish “Heelands” yet without being bitter. Great with a little milk. Smooth and buttery with a touch of golden sweetness. This richly aromatic, whole leaf tea offers a delicious blend of real vanilla from Madagascar and rare Yunnan Superior black tea leaves. Flavorful long leaf Black Tea from Guang Dong, China and tender pink Rose Petals. Delicate and excellent with food. The French Version of the ever popular English Earl Grey Tea. A balanced blend of fine Chinese Black Tea, Bergamot, Lemon and Sweet Orange. A very smoky China Tea with Jasmine Flowers. Never served with milk but excellent with food. Definitely something to taste in your quest for the perfect cup of tea. An acquired taste like a fine cigar. Ask about our other tea selections!